I agree with him. The focus on engineering and technology often causes stories with solid speculative biology and chemistry to be overlooked as "hard" SF. Do you think high school level science textbooks should include science fiction references or examples? A recent study suggests that science fiction can stimulate students' interest in science. "It was carrying two species of bacteria, and a giant virus that no one had seen before—they called it Lentille virus. Inside that, they found a virophage—an virus that can only reproduce in cells infected by other viruses—which they called Sputnik 2. And in both Lentille virus and Sputnik 2, they found even smaller genetic parasites – tiny chunks of DNA that can hop around the genomes of the virus, and stow away inside the virophage. They called these transpovirons." "... the planet is baking hot, far too hot to sustain any kind of life as we know it, or even liquid water." Materials science turns to nature: Spider silk is very thin, stronger than steel, extremely flexible and can transmit light almost as well as glass fiber optic cables. Even better, the human body doesn't have a problem with implanted fibers and the components are biodegradable. That means that there is the potential to use silk produced by spiders or silkworms to develop implantable biomonitoring devices that do not need to be surgically removed. And perhaps far in the future there will be electronic devices that can be composed, rather than producing toxic waste. 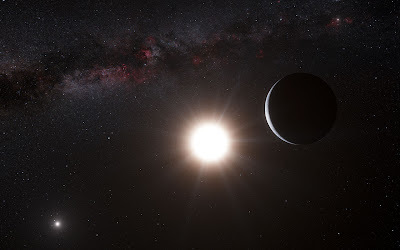 Top Image: Artist’s impression of the planet around Alpha Centauri B. Credit: ESO/L. Calçada/Nick Risinger (skysurvey.org) Released by ESO under the Creative Commons Attribution 3.0 Unported license. More artist's images and diagrams can be found at ESO.gov.